What is the S.O.S. — Save Our Seniors campaign? 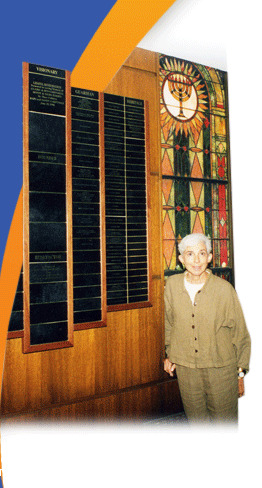 Daughters of Miriam Center/The Gallen Institute’s $12 million S.O.S.- Save Our Seniors capital campaign’s objective is to continue to provide our seniors with a continuum of care campus that conforms with 21st century needs. Funds raised from the campaign will restore and renovate the facility and enable staff to more quickly and efficiently respond to residents’ needs. In addition, this project will also allow the Center to address several significant operational opportunities to enhance organizational effectiveness. Why do we need the S.O.S.— Save Our Seniors campaign? In order to fulfill its mission to our residents, families, and the community, the Center must update its facilities and equipment to provide the best in resident care and services. Since its beginnings in 1921, the Center’s philosophy has been to work in partnership with the community to determine the most urgent needs, and how best to meet them. Each expansion and renovation project was preceded by strategic planning that identified specific healthcare needs. Once those concerns were evaluated, specialized programs and services were developed to meet those needs. Today, in order to remain competitive, we must refurbish, renovate and rightsize DMC. How did the Center determine what the community needs? A broad-based community task force, composed of the area Jewish Federations and supported by consultants in the fields of gerontology and market research, determined the priorities after analyzing and evaluating the future needs of seniors in Northern Jersey as well as the needs of our existing campus. What were the findings of the market research? The size of the age 80+ population in the Center’s service area includes 7,660 Jewish persons with a nine percent projected five-year growth rate and an additional four percent projected growth rate after 10 years. These statistics indicate that there will be increased demand for long-term care services. Additionally, the findings revealed that there is a need in our intake area for moderate-cost independent living, moderate-cost assisted living frail care units and dementia care units, and respite care beds. This campus, serving all economic levels of the Jewish community, will continue to provide an atmosphere that will be welcoming and inviting to residents, families, visitors, day program clients, children and staff. The updated campus and its programs will significantly change the public’s perception of a long-term health care center. Rather than being seen as a place of last resort, it will now be perceived as a friendly environment that emphasizes living life to its fullest within a home-like, Jewish atmosphere. Where will the funds for the project come from? to fund the remaining capital required for the project. Why should we contribute to this campaign? Providing for the elderly and infirm is part of our heritage. Our facility is in need of updating to meet the increasingly sophisticated medical, psychosocial and care needs of our elderly. Our programs need to be enhanced. This campaign will permit us to make these changes a reality, and improve the quality of care and quality of life for the elderly and infirm. When you contribute to this project, your name will be added to a growing list of caring community members who recognize and respect the needs of the elderly and wish to ensure those needs are met. By participating in this campaign, you support a tradition of caring and compassion, and enrich the quality of life for many in our community. All of us know someone facing the challenges of aging in the years ahead—a relative, a friend, perhaps, soon, even ourselves. With your support, we can build a foundation for years to come, extend our legacy of caring for our elderly and keep our promises to the generation that raised us. How can we contribute to the campaign? Your tax deductible gift of cash, securities, real estate or other personal property, or in the form of a pledge, are all welcome. Our committee members and staff can assist you in choosing a method of giving that is appropriate for you. What is the time-line for the campaign? The S.O.S. - Save Our Seniors building campaign spans 5 years. How will supporters be recognized? Naming gift opportunities will recognize donors with plaques and walls of honor.